Using extra-virgin olive oil even reduces your risk of breaking a bone! To add to the growing collection of health benefits for extra-virgin olive oil (for example, reducing heart disease, stroke, and cancer), it appears that using more extra-virgin olive oil may also lead to about 50% fewer broken bones! In a study in which participants with high cardiovascular disease risk were randomized to either a Mediterranean diet or a low-fat diet and followed for 8.9 years, those with the greatest intake of extra-virgin olive oil had about half the risk of fractures compared to those with the lowest intake. Interestingly, using olive oil other than extra-virgin was not associated with any reduction of broken bones. Use extra-virgin olive oil as your main kitchen oil! To make sure you are using oil with genuine extra-virgin qualities we recommend choosing a domestic olive oil rather than imported, and with the seal of the California Olive Oil Council on the label, like the widely available California Olive Ranch. Better still, buy locally-squeezed olive juice from Oregon Olive Mill in Dayton, Oregon. If you are interested in buying imported extra virgin olive oil we suggest consulting with a knowledgeable local importer like Jim Dixon at Real Good Food. 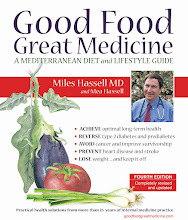 We include about 100 recipes using extra-virgin olive oil in Good Food, Great Medicine (3rd edition), and discuss the many reasons to choose it instead of other vegetable oils on pages 26 and 47-48.